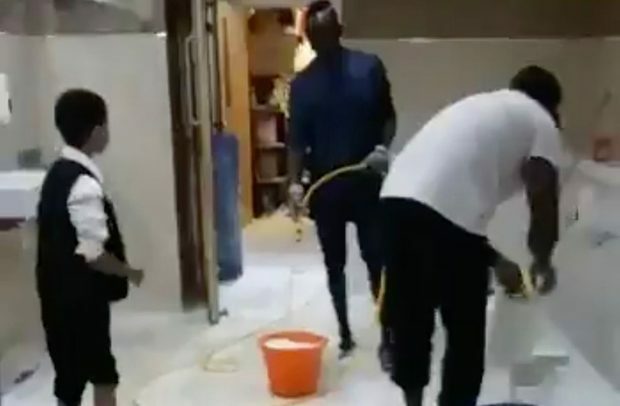 Liverpool attacker, Sadio Mane, has been pictured cleaning the toilets and wudhu area of a mosque just hours after scoring in his side’s Premier League win over Leicester. Mane, who is paid £90,000 a week at Anfield, fired home the first goal in Liverpool’s 2-1 win over the Foxes at the King Power Stadium on Saturday afternoon. However, the footage has now emerged of him helping to clean his local mosque and the clip has gone viral on social media, gaining 9,000 re-tweets and 18,000 likes on Twitter. The video shows Mane filling buckets with water as a young boy grabs hold of a pressure washer to clean the floor. The wudhu area is where Muslims perform the washing ritual before prayer. According to viewers on social media, the footage was captured at the Al-Rahma Mosque in Liverpool. Mane is a devout Muslim and celebrates goals by performing sujood – touching his head on the floor and worshipping. The 26-year-old grew up in the small village of Bambali, in the south of Senegal, where his father was the imam at the local mosque. When a Senegalese reporter visited the region after Mane signed for Liverpool in 2016, he was told that the former Southampton winger had recently paid for the mosque to be reconstructed. Mane has made a sensational start to the new Premier League season, scoring four goals in four games to help Liverpool to a 100 per cent record.